An essential video for Christian students attending Junior High to College. 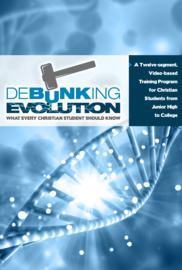 Most public schools teach evolution theory as fact, taking a serious toll on the faith of many unprepared Christians. Yet, the straight-forward account in Genesis provides the true history of Creation, often making more sense of the evidence. Through the fun conversations of the actors, this program provides solid answers about creation, evolution, the fossil record, extinction, adaptation, natural selection, common ancestors, branching & homologous, and human evolution.